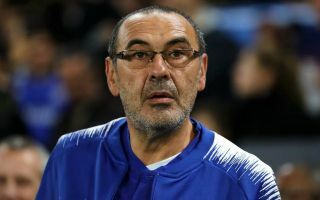 Napoli president Aurelio De Laurentiis has had a cheeky dig at former boss Maurizio Sarri with the Italian tactician under pressure at Chelsea. Poor results and an inability to entirely convince that he can successfully implement his preferred style of play have led to question marks being raised over Sarri’s future at Stamford Bridge already. Their FA Cup exit to Man Utd coupled with dropping out of the top four in the Premier League as well as recent heavy defeats to Bournemouth and Man City have piled the pressure on the former Napoli boss. Speaking about the potential of facing Sarri in the Europa League final with both Napoli and Chelsea advancing to the last-16, De Laurentiis has aimed a subtle dig at his former coach by questioning if he’ll even still be in charge by May to face his old side. “It would be fun to play Chelsea in the final, assuming of course that Sarri can hang on that long,” he told reporters, as per the Evening Standard. “I hope he does stay there and do very well, because Sarri loves his work to the point of madness. “At times this can lead him to lose his temper, but that is to be respected. Chelsea face Man City in the League Cup final on Sunday, with Sarri undoubtedly desperate to win and claim the first piece of silverware to alleviate some of the pressure growing on his shoulders.